Virtual-Hideout.com: Who Else is Missing the Glory Days of WVU Football? Who Else is Missing the Glory Days of WVU Football? There was just something special going to a WVU Mountaineer football game a few years back. It feels like just yesterday I was giddy with excitement for the next WVU game to watch Pat White and Steve Slaton tear up the turf. We got as close as one game away from a National Championship! Oh how the years pass by so fast. Our beloved Pat White doesn't even play football anymore. After a rough stint with the Miami Dolphins, he's now playing minor league baseball with the Kansas City Royals. Slaton is still (barely) with the Houston Texans in the NFL. It's sad when the good times are gone, but rather than live in the past, we must feel blessed to have been a part of such an exciting time for WVU football. 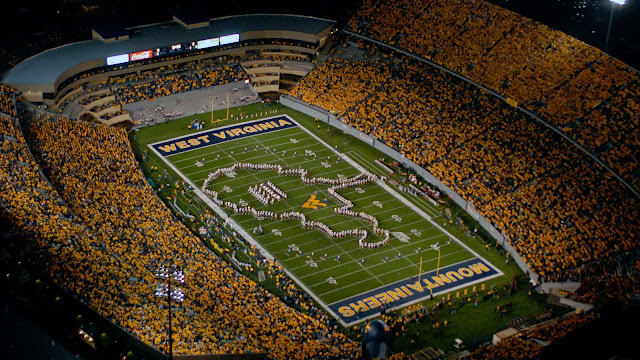 I will never forget those days, the electric feeling in the crowd, the chants of "Let's go!!...Mountaineers!!" from the thousands of screaming students and fans. If you haven't attended a WVU football game in your college journey so far, you really need to. Especially when they're doing good, it's not just a game, it's an experience you'll never forget. Atleast we're finally back on the right track getting ride of Bill Stewart. He's a good guy but he'll never attract top talent.